In the early 1900s, in a little hall on Broadway Street, a Catholic priest bent low over a spotless host and uttered for the first time within the confines of Bradley, the solemn words of consecration. 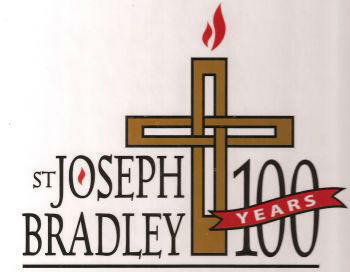 St. Joseph Parish traces its roots to this period when missionary priests arrived in the region of northern Kankakee, now known as Bradley, to administer the sacraments. The Catholics of the neighborhood area were very proud of their religious heritage and enjoyed worshipping and participating in the sacraments in a place near their homes. Started as a mission of St. Patrick Parish in Kankakee, the humble faith community of about 136 people ultimately became a parish in 1904. The original St. Joseph Church in Bradley was dedicated in 1907. It is now part of the parish school building. Hard-working, blue-collar immigrants made up most of the parish. In fact, the community was named in honor of St. Joseph, the patron saint of workers. The founding pastor, Father Joseph A. Milot, wasted no time in relocating parish services from the rented hall on Broadway to a vacant Baptist church on Center Avenue. Land was eventually acquired and construction of the first Catholic church in Bradley commenced. The original St. Joseph Church was blessed and dedicated Jan. 27, 1907, and was designed to serve as the parish worship space and rectory. The cost was $20.,000. Today, this building is the south wing of the current school. Desiring to impart the teachings of the church and the richness of the faith to the next generation, the parishioners began the process of building a parish school. 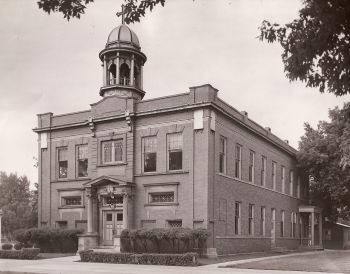 St. Joseph School was established in the early 1920s under the leadership of Father Harris Darche, the parish’s sixth pastor, who had been a Marine Corps chaplain during World War I. He enlisted the services of the Dominican Sisters of Springfield to operate the school. 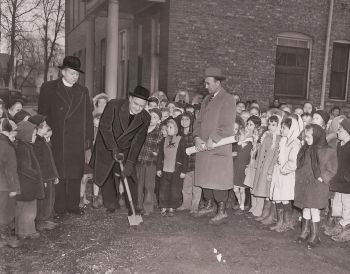 Father Raymond Bernau, parish pastor at the time, scoops the first shovel of dirt during the ground-breaking ceremony for an expansion project in 1948. From 1948 until 1962, the parish’s worship area was located on the second floor of the church and the school was positioned on the first floor of the building. Tremendous growth in Bradley after World War II greatly increased the number of registered families. The church and school soon felt the effects of overcrowding and expansion became inevitable. An addition to the church was dedicated May 29, 1949, by Bishop Martin D. McNamara, the leader of the Joliet Diocese at the time. 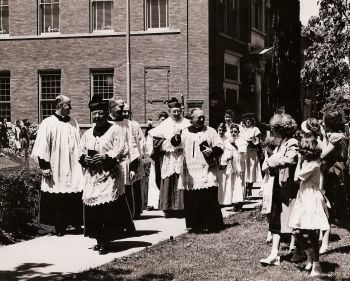 In the late 1940s, Father Raymond Bernau launched a major parish expansion and renovation campaign. An adjoining brick convent was added to the original church. A parish hall was also created in the original church’s basement. The sanctuary in the first church building, which had provided space for believers to pray and worship for more than four decades, was moved from the second floor to the first floor of the building. The second floor was then open for use of the school. Disaster struck the parish in the early 1950s when a fire torched the church building. The damage was extensive, but the parishioners had faith and never gave up hope. Work quickly started on salvaging the building and renovating the facility. Services were celebrated and school activities were held in the Bradley Gymnasium, which is now part of Bradley Central School. Msgr. Emile Cousineau, who is shown above with Fr. 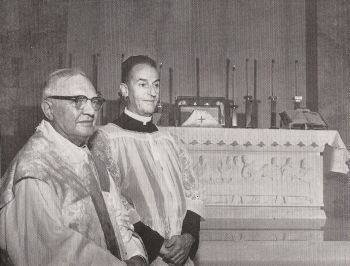 James McDermott, the pastor of St. Joseph Parish at the time, represented the bishop of the Joliet Diocese and blessed the altar of the new church during the first Mass Sept. 15, 1961. 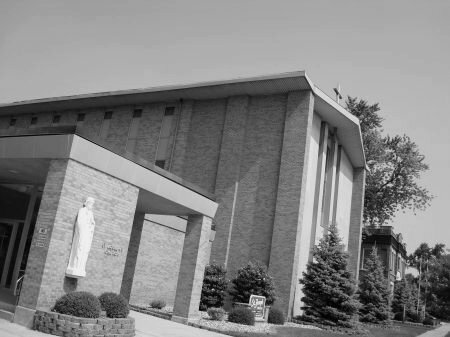 The present St. Joseph Church in Bradley was blessed and dedicated Sept. 9, 1962, by Bishop Martin D. McNamara, the then-leader of the Joliet Diocese. In 1964, construction of the north wing of the parish school was completed. Over the next several years, the people continued to thank God for all of their blessings, serve the poor and disenfranchised, enjoy the company of others and worship at the flourishing faith community. 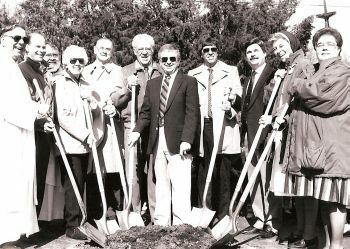 Preparing to break ground for the construction of the parish center are (from left to right) Fr. Joseph Butters, then pastor, Kent Mast, then school board president, Fr. 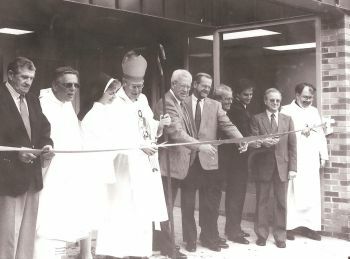 Edd Prather, then associate pastor, Lilian Krueger, Leonard Martin, then parish council president, Scott Seaton, the architect, Bob Voss and Jeff Korstech of Azzarelli Builders, Sister Marcelline Koch, OP., then school principal and Cheryl Geraci, then parish director of religious education. That student and others made good on the promise. The 5,000-square-foot social space is still the social center of St. Joseph Parish. Banquets, breakfasts, meetings, concerts and other social occasions, including Las Vegas in Bradley, and religious formation events and sacramental meetings continue to be held in the building. The central space of the hall, which features a kitchen, also doubles as the school cafeteria and gym for physical education classes and sporting events. Religious Education and Youth Ministry also utilize the space. Administrative offices of these ministries are located near the entrance to the parish hall as well. The official ribbons cutters get ready for the big moment Oct. 5, 1991, as they prepare for the dedication of the parish hall. The parish celebrated its centennial in 2004. The parishioners began the anniversary with a special Mass with Bishop Imesch and a dinner dance afterward. Many who had played active parts in the parish’s rich history were on-hand to celebrate with parishioners. Many aesthetic changes were made to the campus throughout the centennial year to enrich the quality of the parish, including the addition of the beautiful courtyard, which is located between the school and church. Father Tony Nugent, the present pastor, arrived in 2005. A native of the area, he said he has been blessed by the opportunity of returning to minister here. Current members of the parish are grateful for the contributions of their forbearers, who started St. Joseph Parish and continued to nurture the faith community. They feel their efforts every time they worship in the beautiful church building; walk through the school or enjoy an event in the parish hall. Those who had a hand in shaping this community from the beginning and during its early years have left an awesome legacy. The fact that this community is now comprised of 1,200 families is a testament to the faith and commitment of those trailblazers. The richness of the Catholic Church has been passed to those of the present because the parish founders sacrificed so much to serve God and others. Those who make up St. Joseph Parish now are the stewards of this faith community … Our task is to continue answering the call, like the ones who came before us. Our responsibility is to do whatever we can to pass the faith to the next generation, remembering the sacrifices made by the founding members. Our place in this parish’s history is to continue what our forebears started here, making St. Joseph Parish a place of welcoming where people can build a relationship with God. Current members build the parish with faith and relationships. The most important legacy the founding members left was their faith and commitment to Christ and his church. And, we as present members understand that passing that same faith is the best gift anyone could ever give to someone!